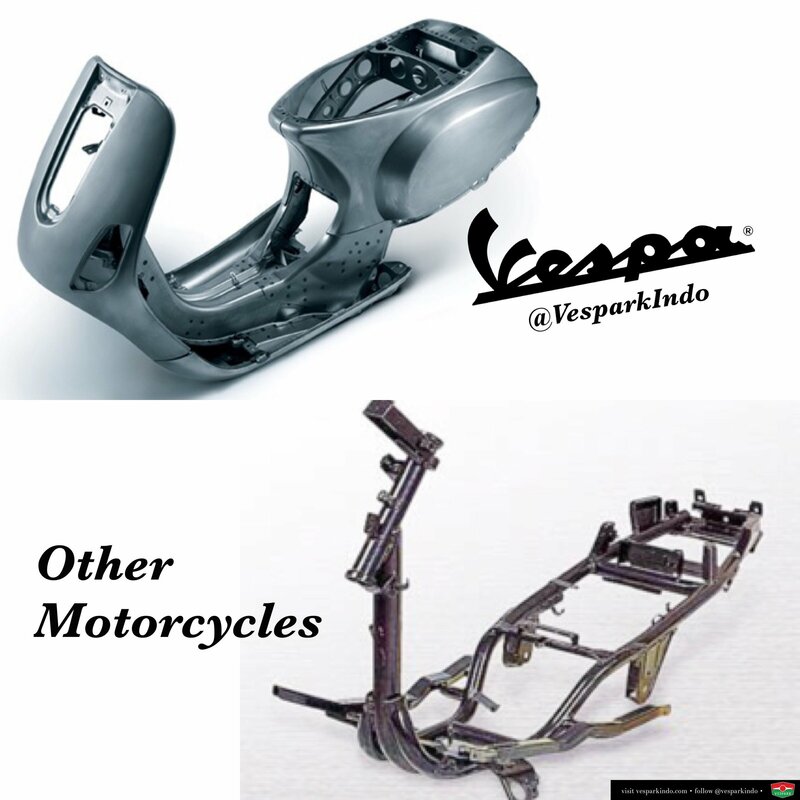 WHAT SEPARATES VESPA FROM THE REST? Vespa is the standard to which all scooters are compared. Vespa represents the entire scooter industry by its very name. Our products are the most coveted in the market–they represent the finest combination of form, function, and performance in the industry. WHY IS VESPA THE BEST? The steel monocoque frame provides greater rigidity–delivering a superior ride and long-term durability. The steel body will last for generations and not deteriorate quickly like plastic. It’s one of the reasons why you see so many vintage Vespas from the ’50’s and ’60’s on the road today. Compared to other inexpensive scooters, it is more expensive to build the Vespa monocoque steel frame. The advantages of monocoque construction include solidity and heft, which translates to a smooth, stable ride, among other things. The minuses include higher cost and greater weight. It is the considerably lower cost of a tubular frame as shown in the picture on top that makes such construction the preferred method for inexpensive scooters. Lambrettas employed a tubular frame because Innocenti was a manufacturer of seamless steel tubing before taking up scooter production in the aftermath of World War II. Vespas are of the highest quality, built with robust and durable components. In addition to the obvious external quality–internal parts such as clutches, rollers, and pulleys are build over and above normal specifications. The single-sided swing arm and trailing link front suspension are cornerstones of Vespa design. These components are extremely functional, creating less friction with the suspension system and providing a smooth and luxurious ride. 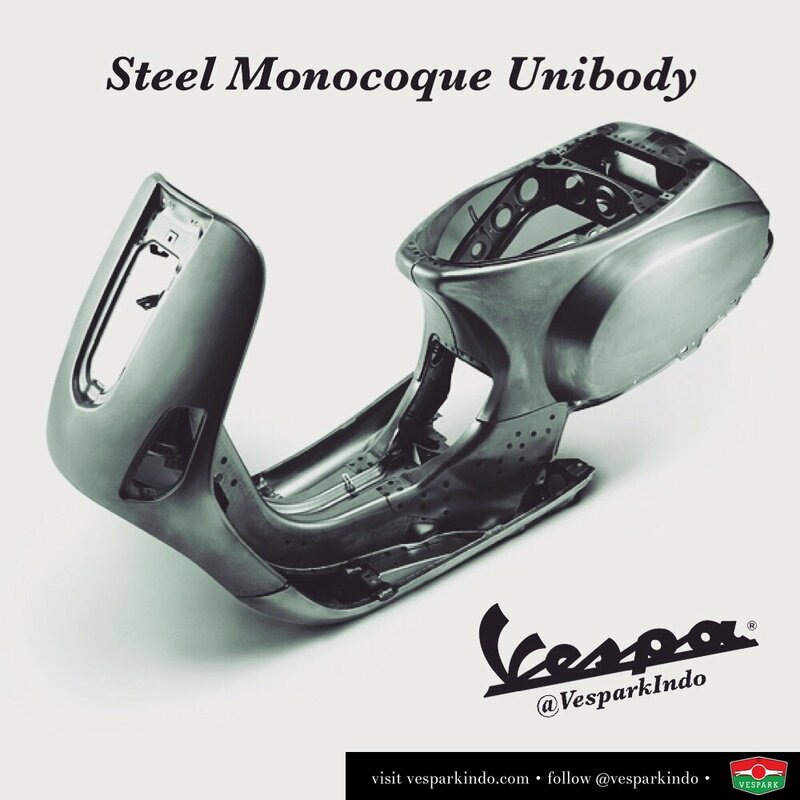 All Vespas are equipped with an adjustable rear shock to assure superior comfort and handling. Adjustable up to 4 settings, it allows the driver to better accommodate a passenger or heavy load. Alloy wheels are far superior than steel wheels. Alloy is lighter, dissipates heat more quickly, resists corrosion, and is easier to maintain than steel. The electronic fuel injection system ensures the air and fuel mixture in the combustion chamber is optimized at all times. Electronic Fuel Injection allows for a cleaner burn and enables the single cylinder engine to pick up smoother and faster from lower engine speeds. EFI results in 15% improvement in fuel efficiency, strong and smooth power delivery and improved performance on cold-starts. Up to 80% of all braking is done by the front wheel. All Vespas are equipped with front disc brakes. Characteristics of disc brakes include: brake force always proportional to the pressure placed on the braking lever, resistance to “brake fade” caused by overheating of brake components and quicker recovery time when immersed in water. Halogen bulbs with high and lo beams come standard on all Vespa models. This increases not only the visibility of the road but of the rider as well. 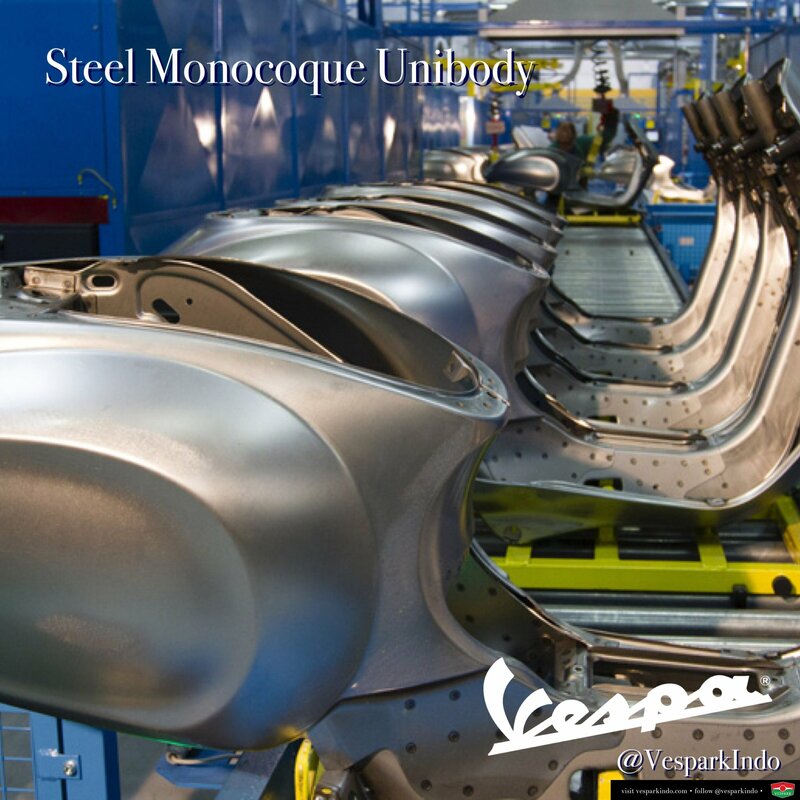 The flawless fit and finish of the Vespa bodywork is a foundation of Vespa design. Vespas also receive rich chrome accents and details such as tucking and hiding body part screws. Other brands have unsightly screws all of the body and leg shield. Vintage Vespa lovers: The GTV and LXV are designed just for you. Both vehicles pay homage to the original Vespa design, with classic details such as ‘naked’ handlebars and a saddle with separate rider and passenger seats. The GTV features a headlamp on the front mudguard, just as it was on the first Vespa prototype. Underneath these historical elements resides a completely modern machine. The GTV is built on the GTS body and 300cc engine while the LXV is built on the LX body and 150cc engine. Both models have leather seats, underseat storage, and an automatic transmission. The ‘V’ series is ideal for those who want vintage design with the ease of modern technology. The Vespa GTS 300 Super combines the iconic Vespa design with modern techology and sporty performance. While the engine offers a solid and manageable ride, the sporty black alloy wheels, white-on-black instrument cluster and the red front spring pay homage to Vespa’s legendary Attention to Detail. Designed to ride smoothly and comfortably on long and short trips, the GTS 300 Super is the fastest Vespa produced and is loaded with an impressively quick liquid-cooled engine and electronic ignition–providing a quick and smooth ride that suits its racy style. The styling of the Vespa S traces its origins back to legendary models like the 50 Special and the Vespa Primavera. With its clean, essential lines, the Vespa S is a modern interpretation of these legendary seventies models. The rectangular headlight and the front shield’s minimal thickness are powerful design features. Reduced in size to reveal the layout of the suspension, the new slender front shield features stylish chrome trim. The contrast piping on the ’70’s-inspired seat emphasizes its stylish shape. Specifically designed for the Vespa S, the rear tail light complements the sleek, simple look of the rear end. Vespa comes in two engine sizes–125cc and 150cc–and features an automatic twist-and-go transmission, steel body and electronic ignition. A low center of gravity and the trailing-link front suspension provides control and agility while ergonomicall-designed seat allows for a comfortable ride. Vespa is the sophisticated choice for today’s discerning rider–modern technology beneath timeless Vespa styling. With a myriad of colors and accessories, there is bound to be a Vespa for you. See what riding in style is really about.